The development of AI in financial investments now is experiencing exponential growth and is rapidly bringing us closer to the singularity. This shows the great interest in the areas of research that will lead to the rapid development of the industry in the near future. 2015 was the best year in Artificial Intelligence funding with almost $1.2B raised, according to VentureScanner with data of investing in startups in the world and in Q1 2016 trend is still positive. 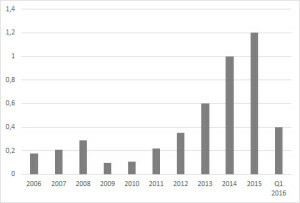 The subdivision of CBInsight VentureScanner in the first quarter of 2016 was tracking 957 AI companies with a combined funding amount of $4.8 Billion. The main amount of companies concentrated in the US – 499, with the United Kingdom at a distant second with 60. 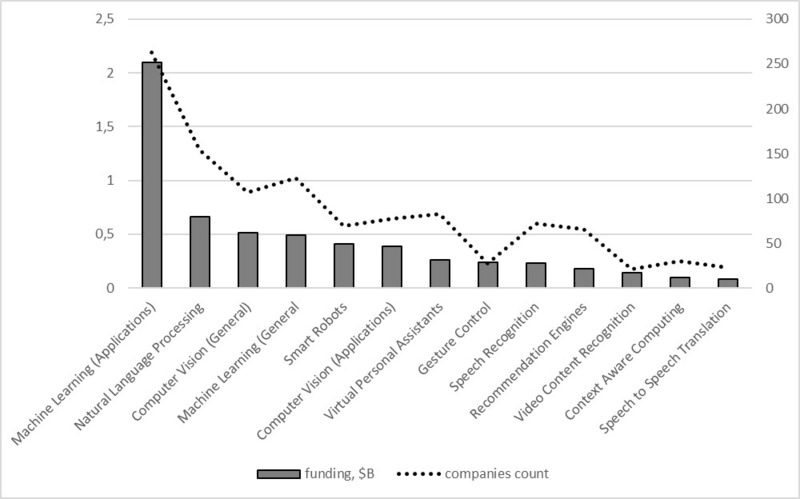 Venture Scanner were tracking 957 Artificial Intelligence companies across 13 categories by count and fundings. The category Machine Learning in Q1 2016 is leading with 263 companies, and the next Natural Language Processing category with 154 companies and the Machine Learning category is leading the market with over $2B in total funding, the second is Natural Language Processing with $662M. It should also be noted that the activities of companies in some areas is practically impossible without progress in others, as companies that deal with virtual personal assistant is obviously very dependent on companies working with voice recognition, definition and context of computer training in general. Thus the development of all areas is important, but most sections of investments obviously most interested in manufacturers of other goods.